M.E. (Myalgic Encephalopathy) is an illness that causes chronic fatigue. M.S. (Multiple Sclerosis) is a neurological condition that affects your nerves and can cause mobility difficulties. The following article is written by Peter Ogilvie, a previous M.E. sufferer. I suffered with M.E. for 7 years. It was very isolating, frustrating and a debilitating disease. Despite the controversy I believe M.E. is a viral infection. I was struck down with the disease after spending a night drinking in a student pub. At the time I was smoking heavily and often lived off take-away food. It seemed overnight, half my brain decided to shut itself down - the following day I was so exhausted and dizzy that I could barely focus on the TV. I went straight back to bed despite having lots of studying to do for my imminent management accounting exams. Unfortunately the extra sleep had no effect on my zombie-like state. Exercise, resting, eating well and drinking coffee had no effect on my energy levels and I suffered with the flu-like lethargy every day for about 7 years. I felt like I was 90 years old. My body was weak, heavy and I had little stamina. Walking up the stairs or to the corner shop was a real effort and most of the time I remained housebound. My concentration and short term memory were virtually non-existent. I was unable to read or watch TV without getting a headache and my social life was severly impaired because I couldn't understand what people were saying (they would speak too fast) or I would forget what they said within seconds. I often felt like the guy who couldn't create new memories in the film 'Momento'. None had any noticeable effect. By chance I heard about a psychic centre in Liverpool city centre and I arranged a visit with a clairvoyant who was also a spiritual healer. She strongly advised that I take up Tai Chi Chuan immediately and learn the Chi Kung breathing techniques. Having nothing to lose I decided to give it a try. To my suprise I noticed that both my mood and energy levels improved after the Tai Chi sessions. After about 7 years of regularly practising Tai Chi I made a full recovery from my M.E. condition. I now look back with a tremendous sense of achievement and believe that I have never been as happy or as healthy as I am today. I highly recommend Tai Chi to everyone wishing to unite mind, body and soul. 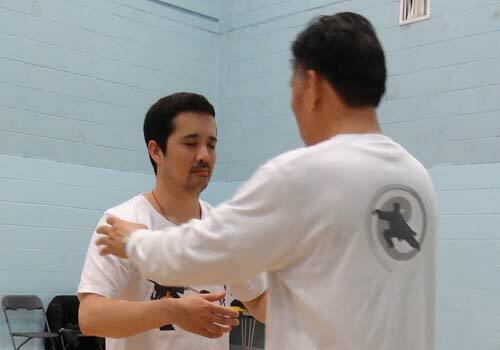 I would also like to give a special thanks to Master Kam Lau for his teachings and his dedication to the art of Tai Chi. The above article was written by Peter Ogilvie many years ago. He has since fully recovered. During his training with us, he has represented our school in many competitions and subsequently won many gold and silver medals. We are very proud of Peter and his achievements. We are currently teaching both chair-based Tai Chi and standing Tai Chi classes at the Multiple Sclerosis Society (MS Society) in Pensby, Wirral (near Heswall). If you are interested in joining this group of people, please contact Mrs. Berni Gallagher (07833 051 707) or email wirral@mssociety.org.uk. The venue is: The Hope Centre, Fishers Lane, Pensby, Wirral CH61 5XE. 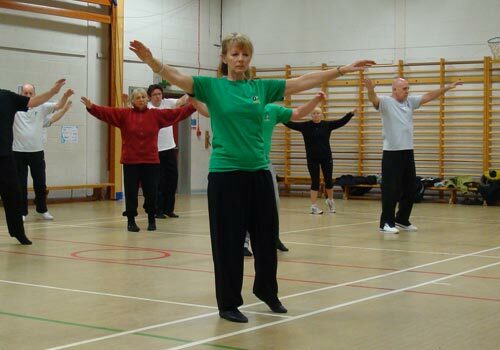 The chair-based Tai Chi class runs on Monday from 11am - 11.45am, followed by standing Tai Chi at 11.45am - 12.30pm. What is Tai Chi and Chi Kung?